Before the trending topic of current situation on the refugees crisis within Europe was gaining its media spotlight, a German-based group has invented a website named Refugees Welcome as response to the problem. 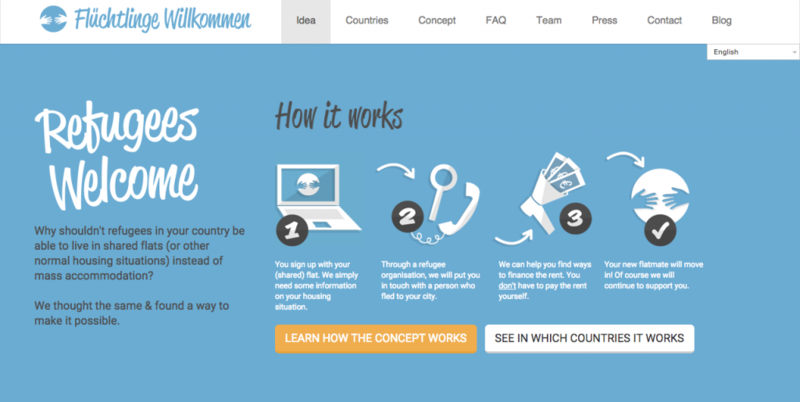 The website aims to match the users, who are willing to share their living space with refugees, with someone who is suitable to be their roommate, and additionally assisted by a local refugee organization. Since it was initiated in November 2014 (Germany) and January 2015 (Austria), the website had matched 138 refugees to share flats and continued gaining inquiries from many citizens in other countries (Elgot; Erbentraut). Famously depicted in the media as ‘Airbnb for refugees’, the website, in fact, works differently contrasted to the Airbnb. Refugees Welcome modified the network hospitality version offered by Airbnb or other similar platforms into their own model of hospitality exchange to place the refugees in proper accommodation. The concept of mixing network hospitality with a humanitarian cause is an innovation derived from the sprouting online platforms within the culture of network hospitality. Network hospitality is a term conceived by Jennie Germann Molz, alludes to the way people connected to one another using online networking systems, as well as to the kinds of relationships they perform when they meet each other offline and face to face (Molz, CouchSurfing and Network Hospitality 220) (Molz, Toward a Network Hospitality 4). Molz modified the term from Andreas Wittel’s The Network Sociality, which discussed the shifting of social interaction toward informational based, impermanent, and iterative relationship (Wittel 66) (Molz 3). Accroding to Molz, “the notion of network hospitality is marked by five characteristics: sharing with strangers, feeling like a guest, engineering randomness, pop-up assemblages, and guests without hosts” (2). Although network hospitality is deemed as a current situation, it has originated from former hospitality exchange network programs, such as Servas International, American Field Service, or other organisations (Tapio Ikkala and Lampinen 3). And later followed by the biggest hospitality exchange peer-to-peer platform, Couchsurfing, which has served its 10 million members based on its website information. On which position Refugees Welcome is situated among other network hospitality schemes, we can understand it through comparing some network hospitality features described by Molz. In the website, the user who lives within the listed countries is allowed to sign up their shared any types of residential accommodation. Unlike the other hospitality exchange websites, where both the host and the guest are able to create as well as check profiles, Refugees Welcome requires coordination with a refugee organization to help and check the profiles of the host and the refugee. When they have found someone suitable, they will contact the prospective host so they can get along together and see if it works well, the refugee is ready to move in afterward. Since Refugees Welcome is not only providing a system for accommodation offerings but also fostering the concept of equal living with roommate or flatmate, the host is not allowed to propose a vacant space or a couch in the living room. Refugee Welcome resembles several features of network hospitality, since it has encouraged the user to share their accommodation with refugees, whom the user regarded as a stranger. As Molz countered to Wittel’s network sociality that stressed on individualization, network hospitality relied on resources sharing as one of the principal currencies of online interaction (7). Moreover, the website’s initiators believe that refugees should not be stigmatized and excluded by living in a mass accommodation segregated from the society. The assimilation with the locals and cultivation of intercultural understanding echoes Couchsurfing and beWelcome’s premise of hospitality (Tan 371). Yet, Refugee Welcome strives for long-term reciprocal team up rather than ephemeral encounter. It only authorizes three-months-minimum host’s commitment, otherwise the registration will not be accepted. The exchange currency proposed by the website is the possible advantages for both sides, that the refugees are settled in proper lodge, learn the language, and easier adjustment to the new environment, and the host is not only doing the simple virtue of helping but also learn the diversity. The next character of network hospitality is feeling like a guest. In most of network hospitality practices, the affection is usually temporary (Bialski 45). This situation materialized from a short encounter of hospitality exchange, while Refugees Welcome has something more to offer through long-term relationship. It needs deeper and longer collaboration, thus the idea of establishing friendship will be tested genuinely. The following aspect is engineering randomness. In a peer-to-peer platform where the user can inspect other profiles, this may lead to the tendency of discovering someone who only shares things in common. As researcher suggested that such selective tendency, is a typical feature in online social networks (McPherson, Smith-Lovin, and Cook 419). In Refugees Welcome, the role of selecting the guest is not conducted by the host, but most part is done by the web admin and the organisation. Thus, other than engineering randomness, Refugees Welcome is designed to embrace randomness. Bialski, Paula. Intimate Toursim, Friendship in a State of Mobility- The Case of The Online Hospitality Network. N.p., 2007. Elgot, Jessica. Airbnb for Refugees’ Group Overwhelmed by Offers of Help. The Guardian 1 Sept. 2015. The Guardian. Web. 10 Sept. 2015. Erbentraut, Joseph. Airbnb For Refugees’ Sees Surge Of People Willing To Help. The Huffington Post. N.p., n.d. Web. 13 Sept. 2015. McPherson, Miller, Lynn Smith-Lovin, and James M Cook. Birds of a Feather: Homophily in Social Networks. Annual Review of Sociology 27.1 (2001): 415–444. Molz, Jennie Germann. CouchSurfing and Network Hospitality: ‘It’s Not Just about the Furniture’. Hospitality & Society 1.3 (2012): 215–225. —.Toward a Network Hospitality. First Monday 19.3 (2014): n. pag. firstmonday.org. Web. 10 Sept. 2015. Tan, Jun-E. The Leap of Faith from Online to Offline: An Exploratory Study of Couchsurfing.org. Trust and Trustworthy Computing. Ed. Alessandro Acquisti, Sean W. Smith, and Ahmad-Reza Sadeghi. Springer Berlin Heidelberg, 2010. 367–380. Tapio Ikkala, and Airi Lampinen. Monetizing Network Hospitality: Hospitality and Sociability in the Context of Airbnb. N.p., n.d. Web. 12 Sept. 2015. Wittel, Andreas. Toward a Network Sociality. Theory, Culture & Society 18.6 (2001): 51–76.